Quinn Bachand is a name to watch. 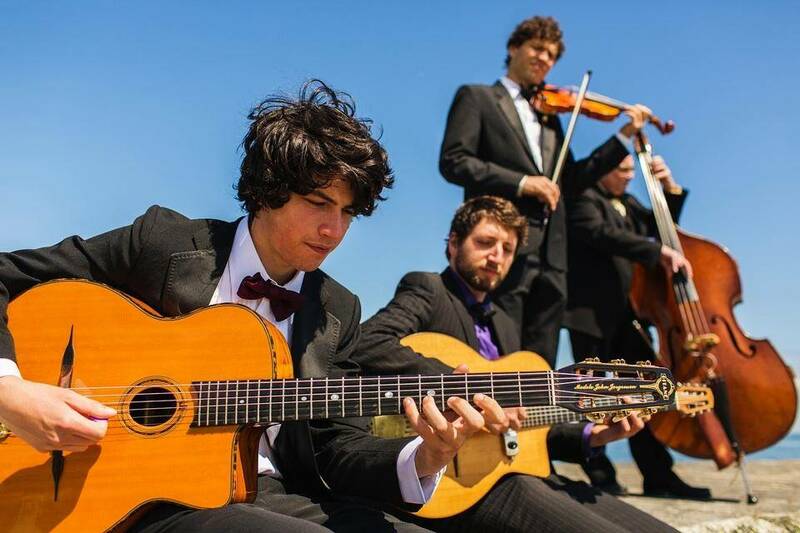 He’s an electrifying acoustic guitar player and fiddler from Victoria, British Columbia, who leads a worldly gypsy jazz ensemble called Brishen. The band warmed up an icy January night with a supremely entertaining house concert at the Canaan Institute, an intimate private venue outside Ithaca, New York, where four unicycles, a fiddle, and an oud hang from ceiling hooks. Throughout the night, Bachand’s solos provided a master class in jazz phrasing with authoritative runs across the fretboard. The band kept the crowd enraptured with frequent instrument switches and amusing stage business. All four musicians took a turn at the fiddle on the traditional “Hummingbird Waltz.” It was easy to imagine these young men busking their way through the plazas of European capitals. In fact, three of the four had just returned from a tour of Belgian concert halls and culture cafes. They will play a few more dates in the northeast before Bachand heads back to B.C.. Brishen returns in May to Rhode Island, Massachusetts, and upstate New York after playing the New Orleans Jazz Fest. More information at www.brishenmusic.com.